NB Commentary: The mystique around this man and his history goes far back for those of us who experienced his rise and unfortunate fall in the boxing world. As a former member of the Nation Of Islam, I remember this man as a hero, a warrior, an artist and a poet. Personally, boxing to me is a brutal sport, one that boggles my mind that anyone would want to step into a ring and beat on another human being. As a sport, it says a lot about who we are as human beings, but as an industry it says even more about the social engineering that takes place that has folks sitting in the audience, cheering their “champion” on as he beats the snot out of another man, and nowadays, another woman. It’s a brutal sport and there have been reports of how diseases similar to Parkinson’s can be gotten by these fighters as their heads and brains are banged around in the ring and during training. Muhammad Ali was known for not allowing his opponent to get any punches to his face and head. He knew how to protect himself from those deadly blows but obviously, a few got in. What I did in my head was to focus on his contribution as a man who “stood up” against the establishment of White Supremacy and the idiocy of fighting the white man’s war when the war was really going on at home. It was a magnificent and moving time during the 60’s and 70’s as movement upon movement emerged from the grassroots and WITHOUT social media, I might add. It was also a tragic time, with our war weary heroes being cut down, one by one. So many people died during this era, so many leaders for social justice, human rights and civil liberties. Occupy Wall Street had nothing on the spontaneity of the various social activist groups that hit the streets. Many too numerous to mention in this short post but the impact of the times still stays with many of us who lived through it. Born in 1951 I grew up in a neighborhood of predominately African Americans in North Philadelphia. My Mother always had this black pride thing going with her and she was one of the first people in our neighborhood to wear an Afro. She was always a rebel of sorts and I still don’t know if she did it to be contrary or if she did it on the real. Nevertheless, the impact that she had on my life remains with me to this day, and I must admit that my love for my people comes from her admiration of the black skinned man and woman. I joined the Nation of Islam in 1971, to my Mother’s chagrin of which I do understand now, but certainly could not fathom what her problem was then. Didn’t she tell me that black was beautiful, didn’t she used to say that folks with light eyes had “the devil in them”? Didn’t she encourage me to be a rebel by her own rebellious way of doing things? I soon realized that she didn’t want me to rebel against her, and that’s what she saw it as because I left the Catholic Church while going to a Catholic College and joined the infamous, Nation Of Islam. 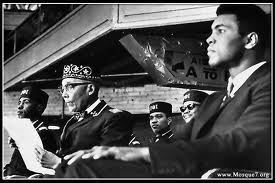 There was the Most Honorable Elijah Muhammad, there was Malcolm X, there was Cassius Clay and there was Minister Jeremiah Shabazz. These folks towered over our heads in the “teachings” and we were in awe of them. And as for me, I will always pay homage to the Most Honorable Elijah Muhammad, the father I never had, the grandfather I never had. He is due that much respect because of the lessons I learned from his teachings. As time goes on we progress, we evolve and we learn but we still remember those days and how they changed us. on this physical plane and made it outa here. It’s amazing how when someone like that makes transition how you seem to time travel back to those poignant moments when they touched your life in a memorable way. Today, I went all the way back to 1971 when he lost that fight. I was in tears, standing near the mailbox, letter in hand, addressed with only his name, telling him how much I loved him and supported him and prayed for him. I dropped that envelope into the mailbox, with no stamp, no return address and no expectation that he would ever receive it as I cried real tears for this man, this icon, my hero, my warrior, “who floated like a butterfly and stung like a bee.” It was a dark day for me because it felt like something cosmic had changed. I didn’t know what to call it back then. The word cosmic was not a part of my vocabulary, but I felt a serious shift in my consciousness and I cried. It felt like a great war had been lost. Knowing today, what I know about sports and entertainment, I have my suspicions about his illness. Some may call me paranoid, but I see it as discernment and critical thinking. When you look at the trail of tears caused by the fallen warriors during that time, it does beg to question… was a fix in?? This video playlist offers some suggestions as to Ali’s debilitating health condition. “She said doctors told her the disease was not the result of absorbing too many punches but a genetic condition. 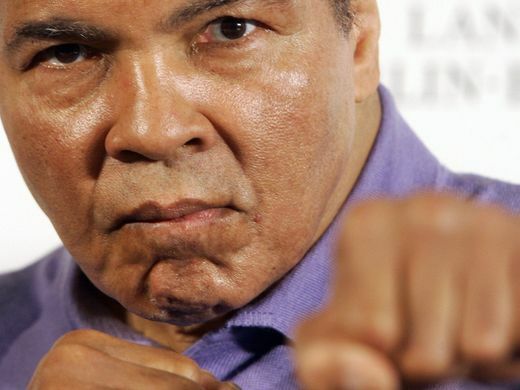 “Muhammad Ali’s personal doctor has revealed he cannot be sure that boxing contributed to the former heavyweight world champion’s Parkinson’s Disease. Ali, considered by many to be the greatest boxer of all time, has suffered with the neurological syndrome since the mid-1980s and it has often been presumed that blows to the head during his 21-year professional career were a contributing factor to his condition. Our young brothers and sisters too, coming home from Vietnam… Malcolm, Martin, John, Robert, Medgar, and many others whose death sent shockwaves around the world….. These tragic deaths have a lasting effect on your psyche because they were rays of hope during a very, very cruel and hateful time. They each had their own battles, they each fought in their own arenas, some even gathered together for the same fight, but they were stalwart in the movement for justice. So, when he lost the fight, I was riddled from right to left, back and forth, up and down. Never knowing any of these people personally but the communal and social mystique surrounding them made them up front and personal in my mind. don’t go back into the ring. You have your championship! You are the greatest boxer of all times, don’t go back. Stay with us, come with us, teach the lessons, so many people listen to you. But he didn’t listen, and we in the Nation kinda knew why he lost. We wanted him to win, we hoped he would win and we prayed on it to, but he lost. And that was the story that we knew would happen, because our Messenger had warned him. To be clear, I am nowhere near as naïve as I was back in those days. I never heard of Co-Intel Pro or any of that stuff before I joined the Nation. I learned about that and more afterwards. But I knew about say it loud, I’m black and I’m proud!!! I also know that today, he can read my message to him, and maybe read that letter I placed in the mailbox decades ago, addressed to him, that let him know, I loved him and that he was one of my heroes. Of course, I am sure he will be very, very busy pouring through his cosmic mailbox. May you Rise In Power. And if you decide to return, may you return to a world of justice, freedom, righteousness and love, a world totally different from the one you left behind. Ali had suffered for three decades from Parkinson’s, a progressive neurological condition that slowly robbed him of both his verbal grace and his physical dexterity. A funeral service is planned in his hometown of Louisville, Kentucky. He turned professional shortly afterward, supported at first by Louisville business owners who guaranteed him an unprecedented 50-50 split in earnings. His knack for talking up his own talents — often in verse — earned him the dismissive nickname “the Louisville Lip,” but he backed up his talk with action, relocating to Miami to work with top trainer Angelo Dundee and build a case for getting a shot at the heavyweight title. 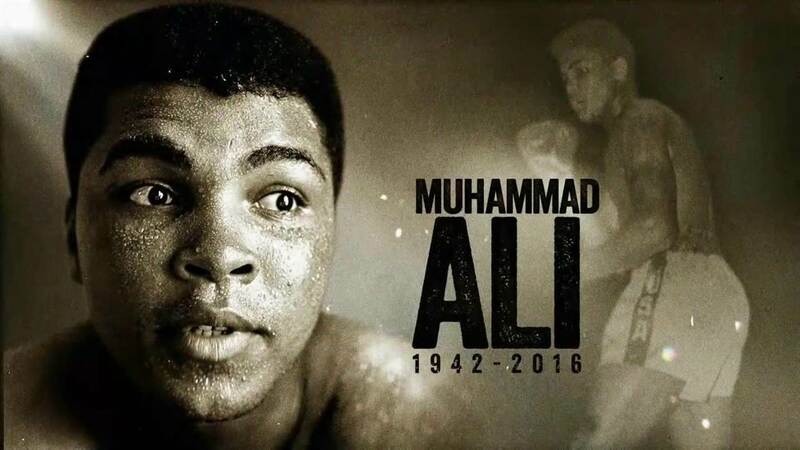 The new champion soon renounced Cassius Clay as his “slave name” and said he would be known from then on as Muhammad Ali — bestowed by Nation of Islam founder Elijah Muhammad. He was 22 years old. The move split sports fans and the broader American public: an American sports champion rejecting his birth name and adopting one that sounded subversive. 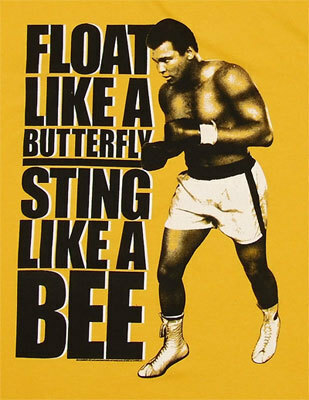 Ali successfully defended his title six times, including a rematch with Liston. Then, in 1967, at the height of the Vietnam War, Ali was drafted to serve in the U.S. Army. He’d said previously that the war did not comport with his faith, and that he had “no quarrel” with America’s enemy, the Vietcong. He refused to serve. His stand culminated with an April appearance at an Army recruiting station, where he refused to step forward when his name was called. The reaction was swift and harsh. He was stripped of his boxing title, convicted of draft evasion and sentenced to five years in prison. 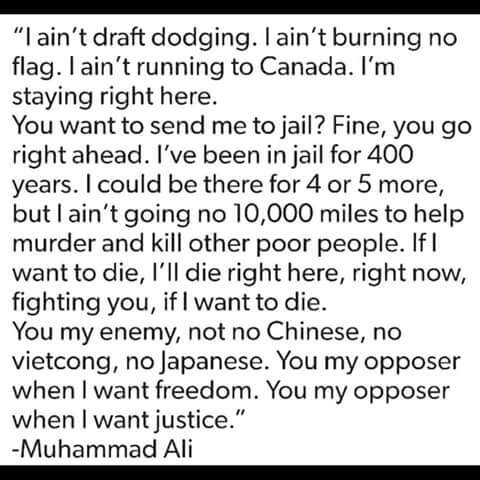 Released on appeal but unable to fight or leave the country, Ali turned to the lecture circuit, speaking on college campuses, where he engaged in heated debates, pointing out the hypocrisy of denying rights to blacks even as they were ordered to fight the country’s battles abroad. Ali’s fiery commentary was praised by antiwar activists and black nationalists and vilified by conservatives, including many other athletes and sportswriters. His appeal took four years to reach the U.S. Supreme Court, which in June 1971 reversed the conviction in a unanimous decision that found the Department of Justice had improperly told the draft board that Ali’s stance wasn’t motivated by religious belief. Toward the end of his legal saga, Georgia agreed to issue Ali a boxing license, which allowed him to fight Jerry Quarry, whom he beat. Six months later, at a sold-out Madison Square Garden, he lost to Joe Frazier in a 15-round duel touted as “the fight of the century.” It was Ali’s first defeat as a pro. That fight began one of boxing’s and sport’s greatest rivalries. Ali and Frazier fought again in 1974, after Frazier had lost his crown. This time, Ali won in a unanimous decision, making him the lead challenger for the heavyweight title. He took it from George Foreman later that year in a fight in Zaire dubbed “The Rumble in the Jungle,” a spectacularly hyped bout for which Ali moved to Africa for the summer, followed by crowds of chanting locals wherever he went. A three-day music festival featuring James Brown and B.B. King preceded the fight. Finally, Ali delivered a historic performance in the ring, employing a new strategy dubbed the “rope-a-dope,” goading the favored Foreman into attacking him, then leaning back into the ropes in a defensive stance and waiting for Foreman to tire. Ali then went on the attack, knocking out Foreman in the eighth round. The maneuver has been copied by many other champions since. The third fight in the Ali-Frazier trilogy followed in 1975, the “Thrilla in Manila” that is now regarded as one of the best boxing matches of all time. Ali won in a technical knockout in the 15th round. Ali successfully defended his title until 1978, when he was beaten by a young Leon Spinks, and then quickly took it back. He retired in 1979, when he was 37, but, seeking to replenish his dwindling personal fortune, returned in 1980 for a title match against Larry Holmes, which he lost. Ali lost again, to Trevor Berbick, the following year. Finally, Ali retired for good. 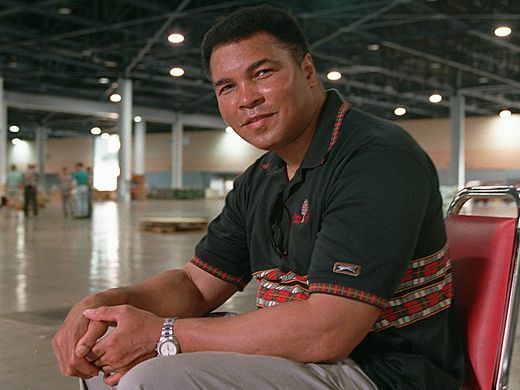 The following year, Ali was diagnosed with Parkinson’s. The average time from the onset of symptoms to death was 16 years. The average age at death was 81. Patients with dementia were nearly twice as likely to die early as patients without memory problems. Patients with a history of delusions, hallucinations, or other psychotic symptoms were almost 50% more likely to die early, compared to patients without the symptoms. Even as his health gradually declined, Ali — who switched to more mainstream branches of Islam — threw himself into humanitarian causes, traveling to Lebanon in 1985 and Iraq in 1990 to seek the release of American hostages. In 1996, he lit the Olympic flame in Atlanta, lifting the torch with shaking arms. With each public appearance he seemed more feeble, a stark contrast to his outsized aura. He continued to be one of the most recognizable people in the world. In 2005, President George W. Bush honored Ali with the Presidential Medal of Freedom, and his hometown of Louisville opened the Muhammad Ali Center, chronicling his life but also as a forum for promoting tolerance and respect. Divorced three times and the father of nine children — one of whom, Laila, become a boxer — Ali married his last wife, Yolanda “Lonnie” Williams, in 1986; they lived for a long time in Berrien Springs, Michigan, then moved to Arizona. In recent years, Ali’s health began to suffer dramatically. There was a death scare in 2013, and last year he was rushed to the hospital after being found unresponsive. He recovered and returned to his new home in Arizona.